LONDON, UK, April 7, 2014 (ENS) – The British-Australian mining giant Rio Tinto will give its shares in Northern Dynasty Minerals, Ltd., owner of the Pebble Project, to Alaskan charitable foundations, ending its involvement in the controversial gold, copper and molybdenum deposit in the Bristol Bay watershed. The decision, announced today, follows the strategic review announced last year of Rio Tinto’s 19.1 percent interest in Northern Dynasty. The review concluded that the Pebble Project does not fit with Rio Tinto’s overall strategy. Rio Tinto’s shares in Northern Dynasty will be divided equally between the Alaska Community Foundation to fund educational and vocational training and the Bristol Bay Native Corporation Education Foundation, which supports educational and cultural programs. The U.S. Environmental Protection Agency concluded in January that the Pebble Mine would pose risks to the world’s largest sockeye salmon fishery in Bristol Bay and to Alaska Native cultures dependent on salmon. The EPA estimated that up to 94 miles of salmon-supporting streams and 1,300 to 5,350 acres of wetlands, ponds, and lakes would be destroyed if the Pebble Mine is developed. In February, the EPA began a process under the Clean Water Act to identify ways to protect the Bristol Bay sockeye salmon fishery from the impacts of the proposed mine. While environmentalists opposed to the Pebble Project expressed satisfaction that Rio Tinto’s withdrawal diminishes the likelihood that the mine will ever be permitted to go ahead, Northern Dynasty President and CEO Ron Thiessen tried to present the development in a positive light. “We are pleased that Rio Tinto’s interest in Northern Dynasty will provide meaningful, long-term economic contributions to charitable organizations in Alaska that are dedicated to providing educational opportunities for young people, and to preserving culture and traditional ways of life,” said Thiessen. “We look forward to meeting with the leadership of the Alaska Community Foundation and Bristol Bay Native Corporation Education Foundation in the days ahead to better understand their long-term goals and aspirations, and how their ownership interest in Northern Dynasty and the Pebble Project can make the greatest possible contribution to the people and communities they serve,” he said. Established in 1995, the Alaska Community Foundation is a statewide platform for philanthropy that holds over $70 million in more than 300 funds for the benefit of Alaskans. The Foundation grants $5-6 million each year to charitable projects and nonprofit organizations across the state. The Alaska Community Foundation will use the gift of shares to create a new Vocational Fund for Alaska’s Future which will support programs that provide vocational training and skills development needed in the mining and extractive industries. The Bristol Bay Native Corporation Education Foundation, established in 1986, is a Native Alaskan charitable organization that supports education and cultural programs for Bristol Bay native youth. Rio Tinto’s withdrawal follows the departure of British mining giant Anglo American last September. Anglo American stated that the Pebble Project posed too much risk and expense during a long-drawn out pre-approval process. 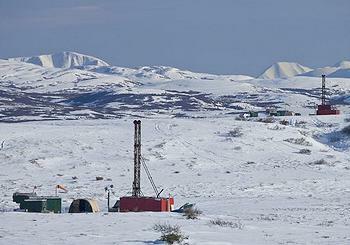 Currently, Northern Dynasty is alone in backing the Pebble Mine proposal.